I will finish this project, though a few happy hours may pass in the meantime. On to day 4, which was brewery-free and when I became 'that guy,' stumbling around the deck and spraying beanbags as accurate as my steps. I still had a healthy stable of beers I needed to slug, so this night fell on the binge-drinking sword. As you might conclude, the reviews became quite brief toward the end of the night. No matter; I didn't expect any of these to blow my mind. They simply made the cut by being obscure or from a state I hadn't sampled or something I was sure I couldn't get at home. The best Mexican beer I've had. Certainly more flavor than any I'd previously tried. Good sweet smell, with a nice balance of hops and malt. Hints of Summit's flagship EPA, but is a bit sweeter and lacked the back-end bite that I enjoy. Sips were filling and thick, but the beer itself went down quite easily. Doesn't hurt that I love the chupacabra. This is not your average amber ale. Hops are incredibly aromatic and it has the hazy ruby appearance of a sturdy IPA. Really nice amarillo hops, which I believe are grossly underused in the juiced hops era. Does have a sweet malt backbone akin to an amber ale, but the big hops on the lips are the story. I'm starting to like these hopped-up reds; recently had Pizza Port's Shark Attack Triple Red and loved that as well. Liked this equally, if not more, than the brewery's West Coast IPA. Assumed this one wouldn't be great when I bought it, but I'd never had a beer brewed with passion fruit before. Nor had I ever had one with a waterfall-bathing beauty on the label. Oh, and it was my first Hawaii beer. Real fruity sweetness. Wouldn't be able to tell you it was passion fruit but I'll take their word for it. So fruity, in fact, ratebeer classifies it as a fruit beer. Of the American Pale Wheat Ales I've had, certainly not my favorite. Maybe I had it out for Left Hand Brewing (much like I did for Boulder Beer), but I did not like this at all. Smelled musty and dirty. And this coming from a guy who typically enjoys ESBs. Very bland flavors. Not much to report. Like I said, the reviews shrunk as the night lengthened. Much more pleasant than the Sawtooth. Had a brighter, more lively smell than most ESBs. I noted it was "real smooth at this hour." Sure, maybe I shouldn't have been reviewing this many beers in one night. I'll give you that. Again, purchased knowing it wouldn't be enjoyed. Tasted like grass. A fair amount of hop flavor, but hops that tasted like grass. Worst beer of the night. Sounds like a good evening except those two bummers. 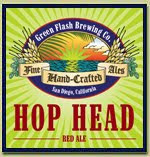 Green Flash I have always thought makes some pretty good beers. I haven't had one for a while, but I would love to try that Hop Head Red you wrote about. I saw that Cucapa when I was out there, never tried it though. Sounds decent. Cheers!